West System 105 Resin - Goosebay Sawmill and Lumber, Inc.
105 Epoxy Resin is the base material on which all WEST SYSTEM 105 System epoxy compounds are built. The resin is a clear, pale yellow, low-viscosity liquid epoxy resin that cures to a hard, solid plastic with superior physical properties. Formulated for use with WEST SYSTEM hardeners, it can be cured in a wide temperature range to form a high-strength solid with excellent moisture resistance. 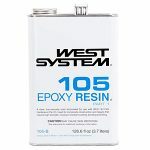 105 Epoxy Resin is designed specifically to wet out and bond with wood fiber, fiberglass, reinforcing fabrics and a variety of metals when mixed at the proper ratio with a WEST SYSTEM Epoxy hardener. An excellent adhesive, 105 epoxy mixtures will bridge gaps and fill voids when modified with WEST SYSTEM fillers and can be sanded and shaped when cured. With roller applications, it has excellent thin-film characteristics to flow out and self-level without “fisheyeing.” 105 Epoxy Resin/207 Special Clear Hardener mixtures cure clear so you can achieve a natural finish when coating with varnish. Formulated without volatile solvents, 105 Epoxy Resin does not shrink after curing. It has a relatively high flash point and no strong solvent odor, making it safer to work with than polyester or vinyl ester resins. We can special order West Sytem 105 Resin in the 105-C (4.35 gal) size. Special orders are subject to minimum quantities but can often be an “add on” to our regular restocking order. Once ordered, arrival time at our store is usually within 2 business days.